Ervin Jones, 81, with his wife of 56 years, Doris, 82. It is a quiet video, less than a half-minute long. It features no flourishes to speak of. Nothing chases, nothing runs, nothing gets blown away. It has no kittens doing kitten things. No cherubs or children peering wide-eyed into the dawn of their lives, to the delight of the camera. None of the things that often make a video go viral. Instead, Ervin Jones, 81, white-haired and bespectacled, sits in his favourite armchair. 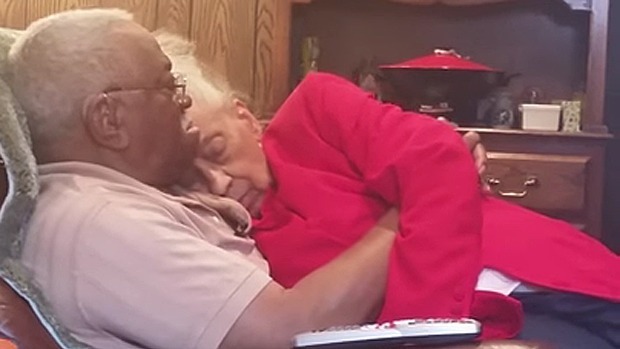 His wife of 56 years, Doris, 82, lays stretched across his lap, her gray head nestled on his chest. He is rocking back and forth, gently lulling her to sleep as the TV plays in the background and a wall clock tick, tick, ticks the time away. It is love in the twilight years. Mostly still. Mostly spent. Most of the couple’s story is unrecorded in the frame, far off, in the long decades behind them. Save this moment. It speaks of faith in the winter of our lives, that the season may find us still in the arms of our beloved. In a week or so, the 39-second video has been seen on social media 4.7 million times. “My parents have been like this all my life,” says Gina Scott, the couple’s daughter who recorded the video. For some reason though, this image felt different, poignantly sweet, and she decided to share it. The diagnosis of Doris’s Alzheimer’s five years ago has taken things from this couple. They’d met at a dance during high school. They married in 1959 and haven’t been apart since. After settling down, he worked as a machine operator. She was a teacher. She took care of the cooking and cleaning. He did all the man-stuff around the house. With her dementia, they don’t dance in the kitchen anymore. She doesn’t tease him as she did. Sometimes she doesn’t remember her husband’s name. When Ervin fried an egg for the first time, he cooked it in fish oil and told his daughter: “It didn’t come out like your mum’s eggs.” It took a long time for him to accept that his wife was ill.
More calls came in that day. By the time Scott finished cooking so she could take dinner to her parents, thousands more had watched. They started telling her how they felt. “To be loved like that! Priceless!” wrote someone. “I’m speechless!!!!!! *tears*, ” wrote someone else. People say to Scott: “I want my life to be like that. I want my husband to treat me and hold me in this way.” They thank her for sharing the moment, and she explains that this is what she and her brother always grew up seeing from their parents. Comedian DL Hughley shared the video on his page. Singer Kelly Rowland shared it and set it to her song This Is Love. But he is a little intrigued by the attention he’s getting. “Then he told me, ‘It’s a blessing, because I love her. God is all in this relationship and always has been.’ ” He prayed that the people watching all could have the same relationship. It’s a quiet, powerful thing that now has millions hoping and praying for a love that carries them through the twilight of their lives.